NEW YORK, NY – 10/25/2016 (PRESS RELEASE JET) — Islamic law forbids the use of alcohol and that means about a quarter of the world’s population cannot enjoy the taste of LIQUORS. At least not until now. The world’s first alcohol-free liquors-flavored beverage is Halal conformed (halal signifies the substance in permissible under Islamic law), feel and taste exactly like liquor. 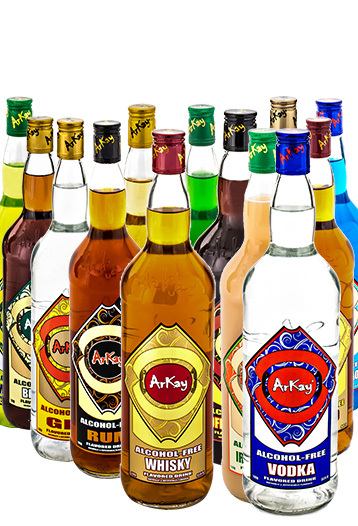 ArKay Halal liquors mimics the taste of Whisky, Gin, Vodka, Brandy, Rum, Tequila, Amaretto, Limoncello, Margarita, Mojitos, Irish Cream, Blue Curacao and Orange Napoleon, it is classified as a soft drink since it contains no alcohol. It is conformed to Halal guidelines and meets the ingredient requirements of both the US Food and Drug Administration and the European Economic Community. The alcohol free liquor collection is available one-liter glass bottles. While the company refers to the product as “Halal liquors,” ArKay targets people who can’t drink due to medical reasons and religious beliefs.” The brand is designed for everyone to enjoy.” Since it tastes and looks “exactly like traditional liquor,” ArKay can be used for drinking straight up, on the rocks, or with soda and mixers. ArKay Beverages is planning to open a chain of ArKay Social Cafés http://www.arkaysocialcafe.com/ where alcohol free liquors will be served by the glass to consumers or sold by the bottle to take away. http://www.arkaydepot.com/ . Alcohol Free Beer will be available in 2017. In recent years, ArKay have recognized the value of the Muslim market and have started to create Halal beverages. In the U.S., for example, a $200 billion market of six to eight million American Muslims is still fertile ground for brand marketers and is just beginning to attract the attention of major marketers. While the HALAL market is roughly equivalent to the KOSHER foods market, the number of products targeting the KOSHER CONSUMER is great and ArKay proposes KOSHER alcohol free liquors as well. Clearly, Arkay Beverages hopes to fill a gap with its Halal and Kosher alcohol free liquor collection of Whisky, Gin, Vodka, Brandy, Rum, Tequila, Amaretto, Limoncello, Margarita, Mojitos, Irish Cream , Blue Curacao and Orange Napoleon both in the U.S. and globally. ArKay alcohol free liquor collection is available on line at https://shop.arkaybeverages.com/ for a suggested retail price of $35 for a 1000 ml bottle. (33 FL OZ) with Free Shipping included when ordering by the case. The company is shipping daily by UPS, FEDEX or DHL overnight to consumers, hotels, restaurants and bars around the world with a 99 % customer satisfaction rating. ArKay ® was created with the purpose of improving people’s lives through beverages, providing taste-rocking, world-changing non-alcoholic liquors crafted in over hundreds of crispy flavored potions and still counting. ArKay beverages is the world’s first non-alcoholic liquors flavored drink collection, and has rapidly gained popularity worldwide with this truly unique and innovative drink. For consumers worldwide looking for an alcohol-free liquor alternative ArKay is the perfect drink to substitute for all alcoholic drinks. ArKay non-alcoholic flavored liquors can be enjoyed ANYTIME, ANYWHERE! In one hand this drink can wait for another years before it goes to a Muslim strictly household. otherwise its a big YES for modern Muslims for this product. For me this drink is not yet going to hit in my house due to very strict family background. My mother will simply put it in the bin. All alcohol free beer, wine, champion are not made from scratch but they are all made from real beer, wine and champion. In Islamic fiqah such as tabdeele Mahiya does not applied to alcohol free beer and wine because Tabdeele Mahiya has specific requirements to apply to Haram product to become Halal such as converting alcohol a Haram ingredient to vinegar a Halal ingredient. In the case of alcohol free beer or wine no such thing happened, there is no chemical reaction, there is no name change which are few requirements of Tabdeele Mahiya. Production of alcohol free beer or wine is 100% based on physical action i.e. removing only alcohol from beer or wine without touching any other components of beer or wine. In USA, FDA requirements of alcohol free beer or wine must contains not more than 0.5% alcohol by volume or Dealcoholised: over 0.05% but less than 0.5% ABV(Alcohol By Volume). So all alcohol free beer from USA in Muslim countries contains a maximum of 0.5% Alcohol by ABV. This 0.5% is the result of alcoholic fermentation of sugars by yeast the principle used in making alcoholic beverages. This alcohol is the part of alcohol present in real beer and wine. Intoxicants were defined by our Prophet Sayyidina Mohammed Sallallahu Alaihi Wassallum when he said in the authentic hadith that was reported by Abu Da’wwod and Al Tirmithi: whatever a lot of it intoxicates a person, little of it is forbidden. In the above hadith there is no mention of amount or number of serving of getting intoxicated by consuming little amount of intoxicant in a product which contains little amount of intoxicant. So consuming number of cans of alcohol free beer is irreverent. The basic point is the large or little amount of intoxicant is Haram and alcohol is a intoxicant. Alcohol content in Alcohol free beer or wine disqualify to consume based on the above hadith. There is no way any company in USA or anywhere can eliminate completely 100% alcohol from a beer or wine used by vacuum processing or using micro filter system to remove alcohol from beer or wine as they currently used in alcohol free beer or wine industry. What about rest of component of beer or wine. It remains as is, nothing happened to them. Alcohol free beer has the same volatile compounds as in original beer or wine. The purpose of alcohol free beer or wine is to maintain similar characteristic including taste, smell as in real beer or wine. All components of intoxicant are Haram because they are not present in original grape for grape wine or original cereals for beer made from cereals. All the components of beer or wine are the by-product of alcoholic fermentation of sugar content of grape or cereal by yeast. So it is in the opinion of MCG that alcohol free beer or wine is not Halal to consume by Muslim. We Gulf Group of Companies and K K Myanmar Company Limited was established in 2004. Gulf Group of Companies has committed to achieve sustainable and reputable service with the contribution of our shareholders and the efforts of our employees. The main responsible activities of the services provided by Gulf Group of Companies and K K Myanmar Business Group are Maritime Service, Travels and Tours Service, Commercial Business Sector on Export and Import, Development and Construction Project, Exchanging Various Type of Currency. Our strategy is to grow Group’s core business by leveraging our premium services and strong market position support by serve comprehensive range of quality and efficient service to our valuable clients. One of the highly regarded projects undertaken by our group was chartered passenger air-crafts of Pilgrims from Yangon to Jeddah in 2008-2014. By successfully completed this mega project, it has enable to provide all Pilgrimages with reliable and satisfied service. After this significant project, we are now planning to focus on investing in the Hotel and Real Estate services. Our Activities are representing national and global principals. K K Myanmar involved in different functions that range from the registration of the manufacturing sales products to the distribution of these principals products throughout the cities and remote areas in Myanmar for importing promotion and to enhance marketing of these products. In short we import all sorts of products from all around the world and promote and distribute all provinces in Myanmar. Presently we own 2 star Hotel Yangon city and Mandalay city we would put in our hotel halal Beer and halal Wine to Myanmar Markets. Please kindly advice how should we import to myanmar markets. But this is not at all alcoholic. It has not been through any process this is water with some natural and chemicals. It just has the name and taste of these liquor. The drink is based on how perfume is made.I used to be a perfumer and perfumes are made of oils. Natural oils and chemical. My A perfumer can mimic a perfumer if he has the right formula. I did it as a perfumer. The owner of Arkay beverages was a perfumer and used the same concepts.it is not alcohol. Does not have alcohol in the contents. I have the ingredients list.i know what is in it.islamically it is Haram to have suspicion. One needs to be sure of the contents of something before we label it Haram.yes if it went through a process to extract the alcohol then we can have doubts.but this is water based with extracts. I can vouch for it because I have received from them the ingredients list. I cannot list it on here because the company will not allow me to but because I wanted to import their products I was sent their list. Their products are even made in Saudi and the UAE. So Arkay beverages is different. It is not alcohol at all.